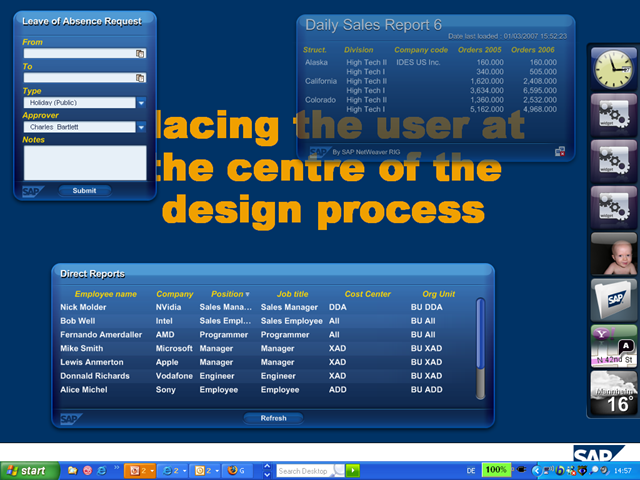 The wonderful widget, awesome Adobe and a payroll demo. This week I was involved a long and intensive presales process. I had the easy bit, kicking off the day and wrapping things up at the end. The SAP UK team did a fabulous job of demoing the complex reality that is payroll and core HR for an organisation with well over 100,000 employees. This is simple goodness from the imagineering team. If you want to learn more about the Widgets, head over to SDN. This provides a good intro, and places them neatly in an “enterprise” context. (thanks also to Abesh) Widgets is an example of how SDN plays a key role in distributing product knowledge; with SAP employees, partners and customers sharing tips and advice. It allows a more rapid adoption and provides better feedback into the development process. There is a huge potential for lightweight process consumption in an ERP context. The Widget is a great starting point, but I expect to see a lot more in this direction. Also have a look at Eventus. Social media and other 2.0 technology is impacting ERP at a much faster rate than I’d expected. Dennis and Hugh take note. SAP’s collaboration with Adobe is a great proof point for how things have changed here over the last decade or so. 10 years ago if we had seen the need for a better forms handling tool we would have taken a bunch of physics graduates and a dark room, and two years later they would have emerged blinking into the daylight with a new tool. Instead, we’ve realised that Adobe know really stuff about forms and building lightweight applications, so it makes a whole lot more sense to work with them, rather than reinvent stuff ourselves. Combining Adobe forms and SAP has made a big impact on HR administrative processes, so this isn’t just about nifty reports. It goes a lot deeper than that. Recently on Starship Enterprisey radio Craig and I spoke with Dan McWeeney, mainly about SAP-Adobe integration. Have a listen. It looks as if I will be at teched this year, so I will get to learn a lot more about this stuff. There is an explosion of frontend innovation going on at the moment. Much to learn. I’ll be at this session for sure, and the Demo Jam of course. Author Thomas OtterPosted on July 27, 2007 Categories IT Related, SAP7 Comments on The wonderful widget, awesome Adobe and a payroll demo. thanks to Christine’s flickr stream. 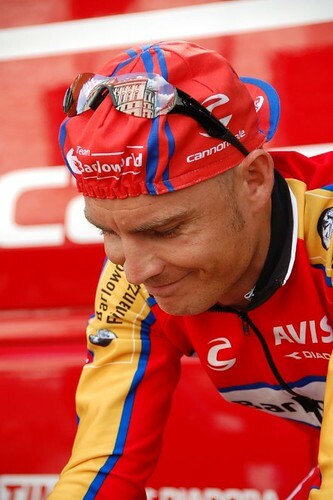 First South African tour de France Stage Winner. I hope he wins the green jersey! The next time I rent a car with my own money it will be from Avis. BTW. If you would like to see a rather odd SAP – Tour de France connection have a look at this post. And you thought your HR HCM transformation project was big and complex. I’m on a big simplicity riff at the moment. We need to get a lot better at doing the simple stuff at SAP, hence my interest in design and UI, and my rantings about over-enterrpiseyness complexity. Today though, I’m going to point to a big, complex project. On the 25th July I’ll be listening to this webex. Hear first hand how the U.S. Postal Service is transforming its human capital management processes and technologies to enhance services and productivity while maintaining a sharp focus on employee needs. By combining SAP system solutions with highly trained human resource personnel working in a shared service environment that is supported by an integrated technology infrastructure, the Postal Service is reducing administrative costs, significantly strengthening data management capabilities and improving overall efficiencies. Learn how this endeavor will ensure ongoing high quality, employee-centered personnel services well into the future. Driving change in an organisation of this size and complexity is a daunting task. US Postal has 700,000 employees, 7 million customers a day and operating revenue of 68,5 billion dollars. Michael, this may interest you too. Author Thomas OtterPosted on July 16, 2007 Categories SAP2 Comments on And you thought your HR HCM transformation project was big and complex.